"Sampath Speaking" - the thoughts of an Insurer from Thiruvallikkeni: Mithali on the brink of making history ! Ravi Shastri's captaincy !! 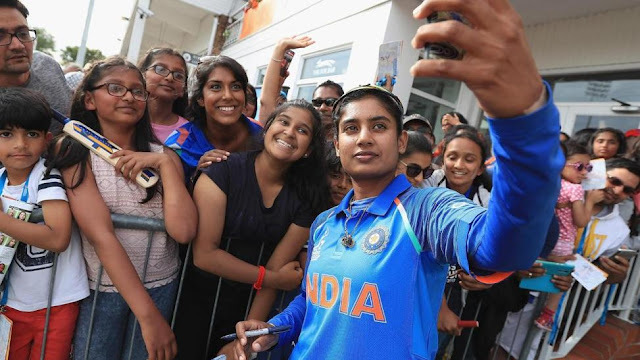 Mithali on the brink of making history ! Ravi Shastri's captaincy !! Aani Brahmothsavam at Thiruvallikkeni kept me busy for 10 days, not posting much on Cricket and not sharing many ! - today India play Australia in ICC Women WC, many of us having been following the fortunes. Here is some Cric update !! Five rounds, 21 matches and 18 days since its start, the Women's World Cup is still without a confirmed semi-finalist. That will change after Wednesday's triple-header that features all of the top five teams, each within a point of the other. If teams have equal points, then the semifinalists will be decided by most wins, then Net Run Rate, and finally head-to-head. Though they hold a 33-8 advantage in meetings against India, Australia have reason to be wary, having suffered their first loss of the tournament, against England. Captain Meg Lanning called for more discipline from the bowlers, with Australia conceding 32 wides. Indian captain Mithali Raj is within touching distance of Charlotte Edwards’ record for the most runs in women’s ODI cricket. Edwards scored 5,992 runs during her illustrious career, while Raj currently has 5,959, needing just 34 to stand alone atop the game. A leading figure in women’s cricket for the best part of two decades, Raj is on course to surpass the former England captain’s record in fewer matches and with the third-highest average of all time in ODI cricket. A hallmark of Raj’s prolific career has been her consistency. In 1999, she burst onto the scene as a 16-year-old with a hundred on debut against Ireland at Milton Keynes, an innings that still makes her the youngest ever ODI centurion. Raj has often been dubbed the ‘Sachin Tendulkar of women’s cricket’ and she shares one of the Little Master’s greatest traits – longevity. Eighteen years after her debut, she is still breaking records, and she recently became the first woman to score seven consecutive fifties in ODI cricket. With 5 completed matches (6 for WI & Pak) – England, Australia, India have 8 points, NZ has 7. Of the 3 with 8 – India is last with the NRR. Back home, the All-India Senior Selection Committee has picked the India Cricket Team for the three-match Test series against Sri Lanka. The team is : Virat Kohli (Captain), M Vijay, KL Rahul, Cheteshwar Pujara, Ajinkya Rahane (vice captain), Rohit Sharma, R Ashwin, R Jadeja, W Saha (wk), Ishant Sharma, Umesh Yadav, Hardik Pandya, Bhuvneshwar Kumar, M Shami, Kuldeep Yadav, Abhinav Mukund. India is set to play 3 Tests, 5 ODIs and one T20I against Sri Lanka during this series. More catching news is - Ravi Shastri, the former India allrounder and team director, has been appointed head coach of the national side until the 2019 World Cup. Zaheer Khan has been named bowling consultant for the same tenure, while Rahul Dravid will be India's batting consultant for overseas Test series. Before we read further, do you know, how many matches Ravi Shastri captained India ? Answer and read on !! The confirmation came late on Tuesday night after the CoA impressed upon the BCCI's Cricket Advisory Committee (CAC), comprising Sourav Ganguly, Sachin Tendullkar and VVS Laxman, the urgent need to end the uncertainty over the next India coach. Shastri was one of five candidates the CAC interviewed for the role, along with Virender Sehwag, Tom Moody, Richard Pybus and Lalchand Rajput. He had not applied when the BCCI invited applications for the first time, but did so after Kumble was no longer in the fray. Nearer home, Angelo Mathews has stepped down as Sri Lanka captain in all three formats, following his side's 3-2 ODI series loss to Zimbabwe. Mathews, who called the defeat "one of the lowest points" of his career and said in its aftermath that he would discuss his captaincy future with the SLC selectors, conveyed his decision to the selectors on Tuesday. In 2014, Mathews had personally played a pivotal role in the Test series triumph in England. Last year, Sri Lanka had also whitewashed Australia - a side they had won only one Test against previously. Lonwabo Tsotsobe, once ranked the No.1 ODI bowler in the world, has been banned for eight years for his role in the 2015 corruption case during the Ram Slam, South Africa's domestic T20 competition. He is the seventh player to be sanctioned under the CSA's anti-corruption code after Gulam Bodi, Alviro Petersen, Thami Tsolekile, Jean Symes, Pumelela Matshikwe and Ethy Mbhalati received bans ranging from two to 20 years. Tsotsobe is thought to be the last guilty player after the independent chairperson of CSA's anti-corruption unit, Judge Bernard Ngoepe, declared the probe closed in a statement. In its entirety the investigation, which started in November 2015, lasted 20 months. None of the players were found to have actually fixed a match in the tournament, something CSA has maintained throughout the investigation. There were, however, attempts to spot fix, including by Tsotsobe. Ravi Shastri played 80 Tests – captained in one. In ODIs, he captained in 11. The moment of glory was in Jan 1988 when Narendra Hirwani debuted and stormed the Cricket world with 8 wicket haul in each innings. Woorkeri Venkat Raman, Ajay Sharma and Phil Simmons too debuted along. India won that match by a huge 255 run margin. Bespectacled, 19 year old leggie Hirwani equaled Bob Massie feat of 16 wickets on debut at Lords in 1972. WI were led by Viv Richards who was consumed in both the innings by Hiru. The line up read Simmons, Des Haynes, Richie Richardson, Viv, Gus Logie, Carl Hooper & Jeff Dujon. Remember seeing that Pongal test match at Chepauk.